Congratulations, you're an adult now! You can drink booze, stay out as late as you want, and you get your pick between the kids' and adults' table at Thanksgiving. It's all gravy, but there's one problem (one can of cranberry sauce, if we're sticking with the Thanksgiving metaphor): Now that you're an adult, you have to get a job. And even worse than that, first you have to find a job. This is going to be a source of annoyance for a long time, so you might as well make it a little easier and look in the right place -- like one of these 25 cities. 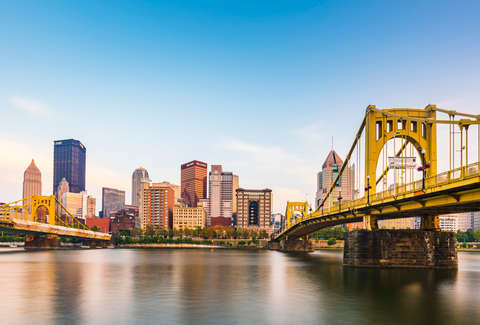 These promising locations come from Glassdoor, which just released its 2018 report on the best cities to find a job in America. To put this study together, Glassdoor compared the 50 most populated metro areas in the United States and graded them on a five-point scale with three factors: hiring opportunity, cost of living, and job satisfaction. Cost of living is defined here as "the ratio of median base salary to median home value" and hiring opportunity is "the ratio of active job openings to population." Beyond those broader metrics, Glassdoor also included handy statistics like the number of job openings listed, the types of jobs that are available, plus the median base salary. You might be surprised to see that marquee cities like New York and Los Angeles don't make the list, but consider this your opportunity to become acquainted with, you know, the rest of the the country. These other cities have a lot to offer. For instance, Boston is the top city for hiring opportunity. Memphis, on the other hand, is the most affordable. And while San Francisco might be the first tech hub that comes to mind, Seattle is also a serious tech hub. Here's the complete list. We believe in you. And if you care more about making money a bunch of money than where you live, check out this list of companies with jobs that pay over $100,000 a year. We won't judge.